A quick Google search on how to build your own blogwill show that you need at least three things to be able to start your project: a content management system, a website builder, and most importantly, a hosting service, so it can be available online. If you can get all three for a price that's comparable to your daily dose of fancy beverage, then your pocket will probably give you a pat you on the back. Well, IdeaHost not only lets you build the blog that you've always wanted, they have the full package to make it live and ready for visitors for a cost that won't feel like a burden. Learn more about IdeaHost and their jampacked feature-set in this review. 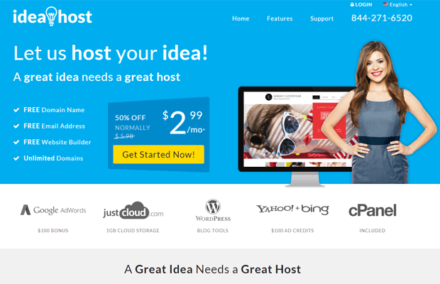 Low Introductory Price: IdeaHost offers quite a budget package with their plan, which starts at $2.99 a month. Domain Name Included: IdeaHost includes a free domain name registration, a godsend for first time bloggers who have yet to secure their domain online. Blog Setup Wizard: IdeaHost's plan includes access to a blog setup wizard, plus a template-based, drag-and-drop website builder. Backup Service Has a Ceiling: Despite running weekly backups, IdeaHost’s backup service is capped at 20 GB per website and isn't part of their service guarantee, so they won't be held liable for any loss of data. Shared Hosting Only: IdeaHost only has one plan -- which is a shared hosting service at that. Signing up for IdeaHost includes an unmetered storage space and bandwidth. It must be noted, however, that while you have no limit with these values, there is an acceptable “normal operation” usage that you have to comply to. Should you exceed this, you will be given 48 hours to make the proper adjustment, otherwise, they will take your account offline. You don’t have to worry though, as 95% of all their customers are able to operate their websites within the fair usage terms. You can also enjoy unlimited domains and MySQL databases, a drag and drop and template-based website builder complete with a blog setup wizard, thousands of templates, a photo gallery setup wizard, a personal email address through cPanel, email forwarding, autoresponders, spam filters, virus checking, POP3/ IMAP email, $100 worth of Yahoo/ Bing credits, and online marketing guides, to help your blog reach a larger audience. Complying to industry standards, IdeaHost has an uptime guarantee of 99.99%, and based on customer feedback, it seems that they are consistent in providing a reliable performance in this aspect. They are even offering a month’s worth of credit in the unlikely case that their downtime goes above 0.01% — this is how confident they are with their service. IdeaHost is a competent hosting service if you are just starting out on your blog, or if you have a small number of followers have yet to acquire a bigger portion of readers and visitors. Given their user-friendly tools and bundled marketing credits, you will have no difficulty setting up shop, and you can expect your blog to take off and get a fair number of visitors and followers in no time. While IdeaHost has a useful support center with a knowledgebase and a search toolbar to help you find related articles to your keywords in an instant, they also make it easy for you to get in touch with their support team. In the main support page itself, you can readily initiate a live chat session, check on their phone line, or send them an email. Their department is open 24 hours a day, 7 days a week to answer all your questions and assist you in any way possible. In the event that you have tried IdeaHost’s service and felt that the plan isn’t for you, you still have the option to request for a refund. They have a 45-day money-back guarantee in these cases, and all you have to do is get in touch with their support team and let them know about your request. Of course, if you have any comments or feedback regarding the service, it would be best to let their representative know about these concerns for they may be able to find solutions to address them. Satisfaction is an important aspect of the total customer service experience, and IdeaHost takes steps to make sure that you aren’t just settling for their service. What's the Verdict on IdeaHost? While IdeaHost may not have the most powerful package, they level the playing field by offering discounted rates that even students and blog neophytes can afford. More than that, they also offer a blog setup wizard to walk you through the setup process, and a solid uptime for website accessibility. They also throw in helpful tools like a user-friendly website builder and marketing credits to give your blog a boost. So if you are looking for a hosting plan that comes at a budget-friendly starting price with all the tools you need to build a blog, IdeaHost is a good service to count on.